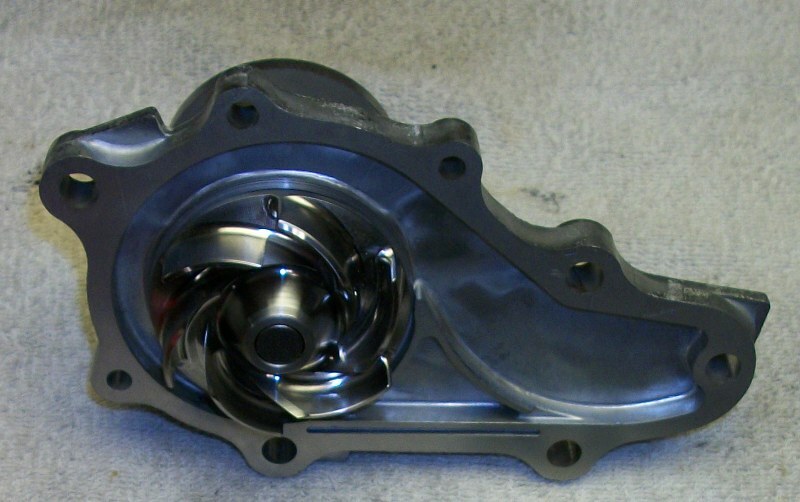 RE-Medy Water Pump with machined impeller versus the stamped steel OEM impeller. Cooling is one of the biggest concerns with the third generation RX-7. And anyway to improve the efficiency of the system is money well spent. I’ve pretty much done everything possible for a street car to improve cooling – bigger radiator, “drilled” t-stat, bigger twin oil coolers, bigger IC, ducted hood, sealed all radiator ducting holes, lowered the AC condenser to feed incoming air directly to the radiator, lowered the fan settings on the PFC, ’99 spec front bumper (larger air intake openings), and of course gone to a single turbo setup, plus some other items I’ve probably forgotten. However, RE-Medy (sold through MAZMART)offers a water pump with a refined pump impellor for more efficient flow. It was a no brainer. A quick polish on the buffing wheel and it was popped on with a new gasket.